120mm fan filter assemblies, 30ppi at GardTec protect cabinet cooling fans as they keep electronics from overheating. The plastic fan guard is constructed with durable materials to provide long lasting protection. Polyurethane foam filter media keeps dust and dirt out of the fan, preventing the fan from slowing or breaking due to buildup. Purchase these fan filter assemblies in bulk and save even more money. GardTec also has a variety of cooling fan accessories available at great prices. 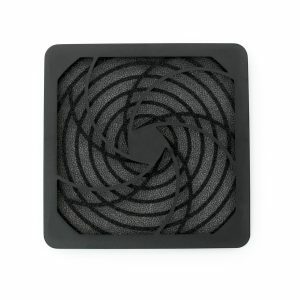 This durable filter assembly is included in some of our cabinet cooling fan kits like the 120mm 120v cooling fan kit.